Pamela Milton is the leader of the Common Wealth. A large group of survivors in the universe of the Walking Dead. The Common Wealth is the largest group encountered by the survivors led by Rick Grimes. They are suggested to number around 50,000. Appearance: Blonde, Caucasian, middle aged, wears pant suit. Some have described Pamela as looking like former First Lady Hillary Clinton. Philosophy: ? Has focus on jump starting civilization. It is not clear what Pamela's background was prior to the Zombie Apocalypse. Presumably she was a a politician of some sort. 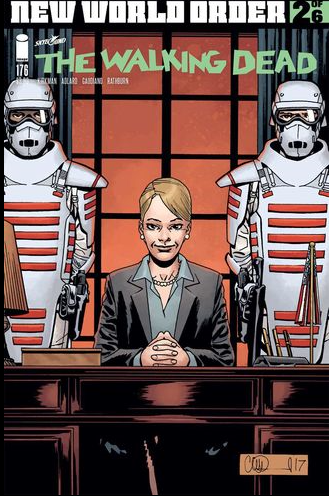 She does seem to be the leader behind the largest, most technologically advanced group encountered by Rick Grimes. It is unclear if the Common Wealth will become enemies or foes of the survivors.